When importing Zend Studio for Eclipse 6.x projects into the workspace of Zend Studio 7.0.0, the standard PHP functions, such as print_r(), explode(), count(), etc. are not recognized as valid functions. Warnings appear in Problems view and in the annotation bar: "Call to undefined function". 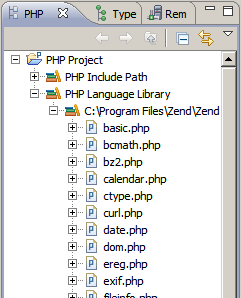 The projects imported from Zend Studio for Eclipse 6.x don't have this library, or the library entry is displayed empty. This problem will be fixed in the next version of Zend Studio. To workaround this problem the user needs to manually add relevant content into the '.buildpath' file. Close the project (Project | Close Project). Open the '.buildpath' file that resides in the project's root directory with a text editor. If the file does not exist, create it. Open your project (Project | Open Project). Rebuild the project (Project | Clean). After the build process finishes, you should see no warnings for standard PHP functions. Starting with Zend Studio 7.0.1 you can import projects from Zend Studio for Eclipse 6.x using the designated wizard - File | Import, Zend Imports | Import from Zend Studio for Eclipse 6.x. Excerpt: When importing Zend Studio for Eclipse 6.x projects into the workspace of Zend Studio 7.0.0, the standard PHP functions, such as print_r(), explode(), count(), etc. are not recognized as valid functions. This article provides a workaround for this problem. When importing Zend Studio for Eclipse 6.x projects into the workspace of Zend Studio 7.0.0, the standard PHP functions, such as print_r(), explode(), count(), etc. are not recognized as valid functions. This article provides a workaround for this problem.